Documents in Distress - and what we can do! 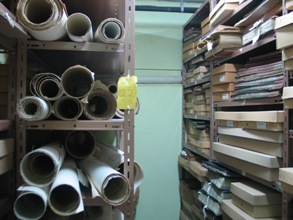 Once documents are catalogued, they become part of the permanent collections of Ceredigion Archives, and are available to everyone for research. But sometimes documents are badly damaged or very fragile when they come to us, and need conservation work which can be very expensive. Some documents are used very heavily, and then we have the option of making surrogate copies (usually photocopies or digital copies) to help preserve the originals. But we never discard the original document, because that is the actual historic artefact, and has additional significance to the information it contains. 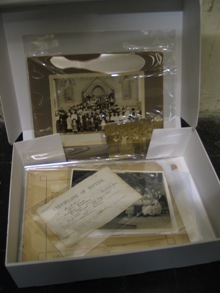 We try to preserve documents as well as conserving them. Preservation involves using the right packaging materials and making sure the documents are handled carefully. 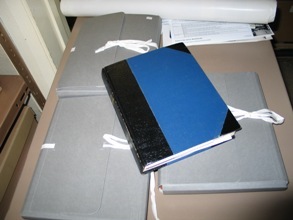 We use polyester pockets to prevent unnecessary handling of the documents themselves, and to support fragile pages. 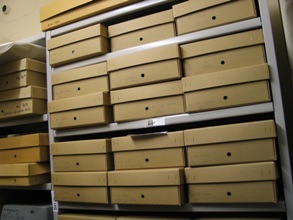 We use acid-free packaging for individual volumes, and buffered cardboard boxes to preserve collections from dust and light. £6.00 will buy a roll of archive repair tape for minor tears in maps and papers. If you would like to help preserve a document please make a donation, either on-line or by cheque payable to Ceredigion County Council. Send your donation to Ceredigion Archives, The Old Town Hall, Queen's Square, Aberystwyth SY23 2EB.